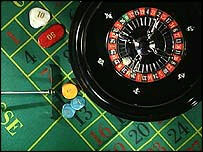 Stanley Leisure has reported a 13% drop in profits after a heavy losing streak at one of its most exclusive casinos. The UK gaming group, which runs 41 casinos and 640 betting shops, saw its pre-tax profits fall to £21.5m ($39.6m) in the six months to 26 October. Stanley said a run of big wins for high stake players at its prestigious Crockfords casino, in London's Mayfair, had eaten into the company's earnings. But the performance of its betting shop division remained robust, Stanley said. The expansion of fixed-odds betting terminals, which allow players to bet on games such as virtual roulette, helped its betting division deliver a 44% a jump in operating profits. And despite the losses at Crockfords - which accounts for around 25% of group earnings - Stanley said it saw signs of its luck changing at the casino, with margins picking up in recent weeks. Stanley said other major casinos were also showing signs of improvement, with its 'Vegas style' Star City casino handling the highest number of punters for the group outside London. The company said it did not expect its lavish Birmingham casino to be profitable this year, but added it remained confident of an "encouraging" full year outcome for the group overall. On the London Stock Exchange, shares in Stanley Leisure were up 6p at 409p by lunchtime on Thursday.